Cast: Scarlett Johansson, Jonathan Rhys-Meyers, Emily Mortimer, Matthew Goode, Brian Cox, Penelope Wilton, James Nesbitt. Story: Adulterous tennis (new balls please). Running Time: 2hrs 4 minutes. You can always expect something a little unusual in a Woody Allen movie. This one pulls it out just at the right moment and blooms into a dark serve-and-volley when it looked like becoming a mundane foot fault. Match Point is the London-based story of rogue tennis pro Jonathan Rhys-Meyers (Velvet Goldmine) and his adulterous affair with rubber-lipped Scarlett Johansson. The movie begins with the rather nicely introduced premise that life is like tennis, inasmuch as the result of both can be decided by a stroke of fortune, such as the ball clouting the net and falling one side, resulting in a win, or the other side, resulting in a loss. So it is with life, and we are shown the similarity very pleasingly in the final half hour. It's just as well, as it was shaping up to be a rather humdrum match before the darkness fell. The second half changes the tone considerably and turns an ordinary adultery tale into much, much more - a movie, in fact, that I'll remember for many years to come. I can't tell you why, though, you'll have to take my word for it - and for once the secrets aren't given away by the trailer. Hurrah! Scarlett Johansson is a promising talent, though she is on less than top form here. Her first scene, in particular, is extremely stilted - though I blame the script and direction for that. Both Johansson and Rhys-Meyers jump into slow and deliberate flirting that seems most incongruous with the setting, and Johansson's particularly hesitant delivery only makes things worse. Fortunately, that's the only scene that stands out - for the remainder she is much more convincing, though not quite matching her previous work in The Island and Lost in Translation. The excellent supporting cast of Emily Mortimer, Brian Cox and Penelope Wilton help to create a warm jolly-hockey-sticks atmosphere and Woody Allen makes full use of the local comic talent, gifting cameos to Alexander Armstrong, Paul Kaye, John Fortune and League of Gentlemen stars Mark Gatiss and Steve Pemberton. 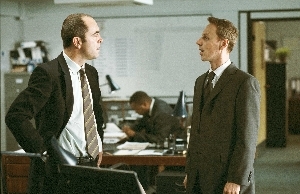 James Nesbitt is the star of the local heroes, though regrettably he only appears towards the end, ably backed up by Trainspotting's Ewen Bremner. Match Point is more than it appears in the trailer - a thought-provoking, dark tale of deception and luck, brought together with Woody Allen's decades of experience. It won't appeal to the younger audience (say under 25), nor will the body-counters get their fix, but for those of us who like a good unpredictable story, it's game, set and match. Testosterone Satisfaction Rating: 1/5 The Scarlett woman lives up to her name but remains covered throughout the immorality. To enjoy this film you should be: over 25 and into dark stories. Match Point is on general release in the UK now.